John Cage wrote 4’33” as a modern music work (1953). It is not played by performers using instruments, but tacet: instruments are not used at all. This does not mean it is a silent work. It is a creation built up of ambient sounds, of that which is present in the moment. Silence is the invitation to explore what truth is and experience that truth is an unfolding quality within each of us. The essence is that that the supposed division between ourselves and others or our environment is recognised to be an illusion. Cage wanted to remove all traces of the ego of the composer in this work. The way the performance sounds is not about the composer, but about the collective – or field – in the audience. The realisation of a circular economy presupposes a mind shift. The challenge is to abstain from an ego-economy (‘I’, materialism and competition) and work towards an eco-economy (‘we’, values and sharing). This process is supported by personal growth. Silence and attention to personal development is crucial and a key factor in society as well as in education. 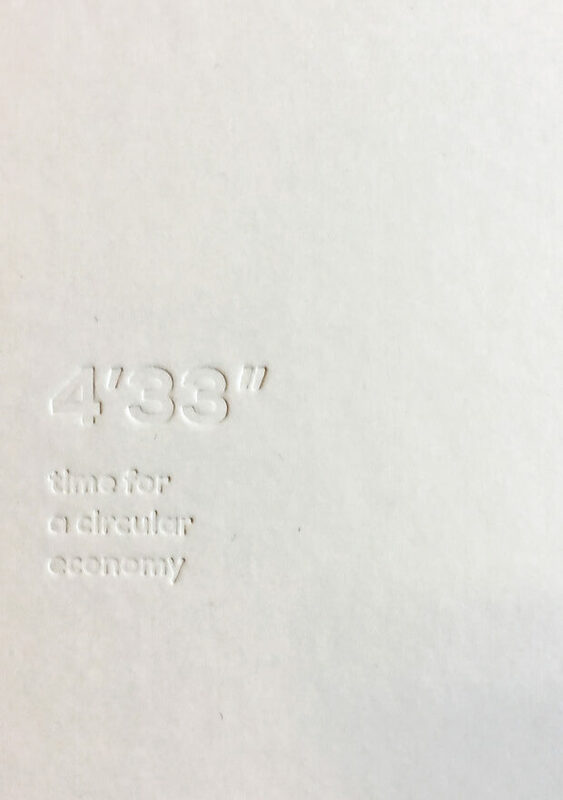 Hey Buddy!, I found this information for you: "4’33” Time for a Circular Economy". Here is the website link: https://www.duurzaam-ondernemen.nl/boek/433-time-for-a-circular-economy/. Thank you.